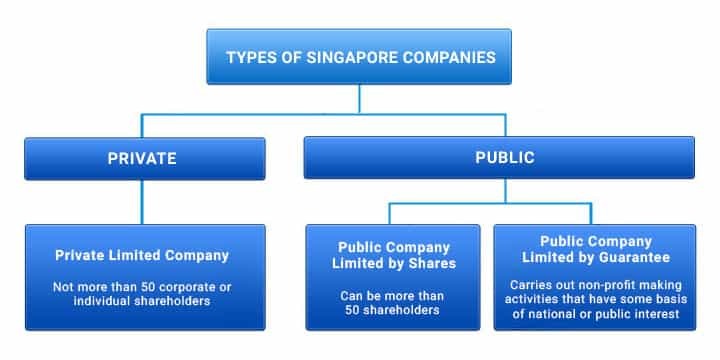 In this page, you will learn about the most common business entity in Singapore, the Private Limited Company – its types, features, advantages and disadvantages. This will also talk about the requirements, procedure and timeline for a Singapore Private Limited Company registration, as well as the post-incorporation considerations and ongoing compliance requirements. For more information about the various incorporation options, please read our guide on Singapore Incorporation Options for Foreign Individuals and for Singapore Residents. Most companies in Singapore are registered as Private Limited companies. Such Private Limited companies usually required to have the suffix “Private Limited”, “Pte Ltd” or “Ltd” as part of the company name. In some parts of the world, Private Limited companies are commonly referred to as corporations, Incorporated (“Inc.”), limited liability companies, unlimited companies as part of their name, though the latter cannot be used in Singapore. The registration of companies in Singapore is done through the Accounting and Corporate Regulatory Authority (ACRA). It is a locally incorporated company where the maximum number of shareholders is limited to 50. A private company is one whose memorandum or articles of association restricts the right of its members to transfer their shares in the company. The restriction on the right to transfer shares in a private company usually takes the form of a requirement that the transfer is first approved by the company’s board of directors or a requirement that the shares be first offered to be transferred to existing shareholders. A Public Company Limited by Shares is a locally incorporated company in which the number of shareholders can be more than 50. Public companies may or may not be listed on a stock exchange. Where they are so listed, they are usually referred to as “listed companies”. The company may raise capital by offering shares and debentures to the public. A public company must register a prospectus with Monetary Authority of Singapore before making any public offering of shares and debentures. A Public Company Limited by Guarantee is one which carries out non-profit activities with national or public interest, such as promotion of art or charity. The Minister may approve the registration of the company without the addition of the word “Limited” or “Berhad” to its name. An independent legal entity separate from its owners – it can sue and be sued in its own name, and the company’s directors and shareholders are not liable for the company’s debts. Company directors and shareholders’ have limited liability to the company. As long as the shares are paid up, then there are no other obligations of the members/shareholders to the company’s creditors, and their personal assets are protected from these creditors. Among the advantages of a Private Limited company is that, by incorporating a Private Limited company, the entrepreneur conveys a professional commitment therefore increasing the company’s chances of obtaining commercial loans from banks/ financial institutions. A Private Limited company is also a vehicle that enjoys special tax exemptions and incentives— for instance, the first S$100, 000 of taxable income is exempt from taxes and effective tax rates can be as low as 5.6% on taxable income of up to S$300,000. Shareholders not personally liable for debts and losses of company. Newly incorporated companies are entitled to tax incentives and exemptions. The company, as a separate legal entity, does not cease to exist if one or more of its shareholders die. Ownership of a company can be transferred and additional shareholders can be appointed. Shareholders’ personal assets are protected since they are not personally liable for debts and losses of company. Ownership is transferable and additional shareholders can be appointed thus enabling additional capital injection for expansion purposes. Conveys a professional commitment and vision hence maximises the potential of loans from banks and other financial institutions and also establishes a credible image among the business community. Company is perpetual and business operations are undisturbed by changes in shareholders or the holding pattern. Among the disadvantages of incorporating a Private Limited company is that Directors must disclose to the company information about their interests in the company’s shares, contracts and debentures. A Private Limited company’s memorandum and/or articles of association is also supposed to restrict the right of its members to transfer their shares in the company by stipulating that any transfer has to be first approved by the company’s board of directors or that the shares be first offered to be transferred to existing shareholders. It is governed by rules and regulations stipulated in the Singapore Companies Act. Violation of rules and regulation will result in penalties. Annual Returns and Directors’ Reports are required and must be filed, and thus the company must have at least one director and one company secretary. Greater disclosure and administration requirements, therefore operation costs are generally higher. Directors must disclose to the company information about their interests in the company’s shares, contracts and debentures. Companies can be more expensive to set up. Incorporation of Singapore Companies: A Singapore Company comes into existence upon registration under the Companies Act. It can have a minimum of 1 member. The members can be individuals or corporations. Members of a company are most commonly referred to as ‘shareholders’. The Private Limited company is governed by the Singapore Companies Act, and has to also comply with the laws, rules and regulations under ACRA and the Inland Revenue Authority of Singapore, among others. Shareholders: A minimum of at least one corporate or individual shareholding is required. A director and shareholder can be the same or different person. 100% local or foreign shareholding is allowed. Singapore Companies Act allows a minimum of one and a maximum of 50 shareholders for a Singapore Private Limited Company. Details of shareholders will appear on public records. Resident Directors: Singapore Private Limited Company must have at least one director who must be an “ordinarily” resident in Singapore, which means a Singapore citizen, a Singapore permanent resident or a person who holds an Employment Pass/Entrepass or a Dependants’ Pass with a residential address in Singapore. There is no limit on the number of additional local or foreign directors a Singapore Private Limited Company can appoint. The director must be at least 18 years of age, and must not be bankrupt or convicted for any criminal malpractice in the past. Information of the directors will appear on public records. Directors can also be shareholders or vice versa. Persons convicted of specified offences or offences involving fraud or dishonesty punishable with imprisonment for three months or more. (The disqualification is for five years from the date of conviction of the relevant offence, or, where the person has been sent to prison, from the date of release). Company Secretary: All Singapore Companies must appoint a competent Company Secretary. The company secretary must be a natural person who is an “ordinarily” resident in Singapore. Singapore Companies Act requires companies to each appoint a company secretary within six month of incorporation. As a company secretary, you will become an officer of the company, sharing legal responsibilities with the directors for certain tasks required by the Companies Act. The company secretary is responsible for the efficient administration of a company, particularly with regard to ensuring compliance with statutory and regulatory requirements and for ensuring that decisions of the board of directors are implemented. Note: The audit exemption for small company criterion will be applicable to companies for a financial year commencing on or after the effective date of the change in law. Share Capital/Paid-up Capital: The minimum paid-up capital for registration of a Singapore company is S$1 or its equivalent in any currencies. The minimum issued capital is one share of par value. “Bearer” shares or “No par value” shares are not permitted.The Share or paid-up capital can be increased anytime after incorporation of the company. The issued share capital of the company is the total number of shares existing in the company multiplied by the nominal value of each share. Shares in a private company are usually transferred by private agreement between the seller and the buyer, as shares in a private company may not by law be offered to the general public. Registered Address: Every Private Limited company must have a registered office, which does not need to be its usual business address. It is sometimes the company’s lawyers or accountants, for example. The registered address must be a physical address and cannot be a PO Box. Use of residential address is allowed for certain types of business. All official letters and documentation from the government departments (including ACRA & Inland Revenue) will be sent to this address, and it must be shown on all official company documentation. If a company changes its registered office address after incorporation, the new address must be notified to ACRA. Governance Structure: The governance structure of a company and the interrelationship between the company and its shareholders is governed by the company’s constitutional documents (the Memorandum of Association and the Articles of Association) as well as by the provisions of the Companies Act. Note that as of 1/1/2016, the memorandum and articles of association will be merged and renamed into a single document called the “Constitution”. All existing companies incorporated prior to the date, will not be required to merge the documents and simply can continue with their current M&A. It is also not uncommon to find the members of companies (usually in joint venture arrangements) entering into ‘shareholder agreements’ as among themselves to capture some of their key rights and obligations in relation to how the company is to be structured and managed. Once the company has been incorporated, you may open a corporate bank account with any of the local or international banks based in Singapore. Most banks require that the account signatories and directors be physically present in Singapore for paperwork signing when opening the company bank account. If you are unable to come to Singapore, some banks may accept the signing of documents at one of their overseas branches or at a Notary Public. The Certificate of Good Standing proves the existence of a company registered in Singapore, and that it is still live on ACRA corporate register. It bears the electronic signature of the Assistant Registrar of ACRA, and is available for companies only. The name of the company, its incorporation date, status and activities will be stated on the certificate. Private schools, video companies, travel agencies, liquor distributors, moneylenders, banks, Financial advisers, childcare centres and importers, wholesales and retailers of liquor licenses are some examples of businesses that need permits to operate. Custom Registration: If your business activities involve import, export and transhipment in and out of Singapore, you will need to register your company with the Singapore Customs and obtain a CR Number or commonly known as Custom Registration. The central registration number is mandatory for Singapore companies or organizations engaged in trading activities. Registration of Singapore Central Provident Fund (CPF): The Central Provident Fund or CPF is a compulsory pension fund scheme in which the employer and employee contribute a percentage of the monthly salary to the fund. CPF contribution by the employer is mandatory for all local employees who are Singapore citizens or permanent residents earning more than S$50 a month. The maximum CPF contribution rate for employer and employee is 17% and 20% respectively and can be lower depending on certain factors such as employee age, permanent resident status, etc. CPF contribution for foreign employees is not required. An hour is all we need. Coupled with transparent, highly-competitive pricing and timely, committed support, your Private Limited Company registration is made easy.